Bully 4u provides workshops for students at primary and post-primary level. Workshops for secondary level students take one and a half hours. They are highly interactive with role play exercises and an audio-visual presentation. Ideally two classes attend a workshop, however we prefer if the numbers don’t exceed 55 students. A video is also shown which clearly demonstrates how pervasive and dangerous cyber bullying can be. Interactive exercise which engages all students and challenges them to put themselves into the shoes of a victim of bullying behaviour. Identify the unique features and impact of cyber bullying. Increase the student’s understanding and awareness about the problem of cyber bullying. Learn strategies to empower students to respond in a positive manner to cyber bullying, and to foster a culture of e-safety. Digital footprint and the future consequences for employment and university applications, practical examples are used to illustrate. The dangers of sexting and the legal implications of participating in this practise. Be empowered to recognise and effectively address cyber bullying. Gain tools and skills needed to respond to cyber bullying. Increase the students ability to effectively ‘discuss’ cyber bullying issues that may arise in the future. A video is shown which clearly illustrates the pervasive and destructive nature of cyber bullying. Students are then given an opportunity to ask questions and discuss the issues which confronted them during this thought provoking and emotional production. Students receive a certificate at the end of the workshop. 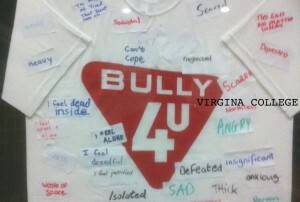 Click here, for a list of schools that Bully 4U has visited for Student Workshops.